How accessible is your card office website? A card office’s website is a natural extension of the student-facing services supported by the campus card, providing valuable information to students and other members of the campus community. But depending on your university’s website, navigating to the card office page — and the important information it provides — isn’t always easy. 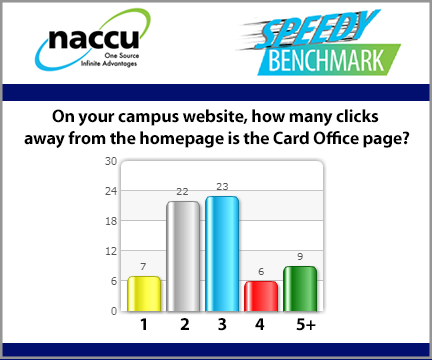 The National Association of Campus Card Users recently polled its member campuses to determine just how accessible their card office websites were with a Speedy Benchmark report. The survey used the “three-click rule” — an unofficial web design rule for website navigation — for reference, which suggests that website users should be able to find any information within three mouse clicks from the homepage. The Speedy Benchmark was a quick, one-question survey designed to collect data that’s important to NACCU institutional and corporate members. The information gleaned from the report will help, in part, to guide future Association activities. NACCU members were surveyed regarding their campus card office’s online accessibility. Specifically, campuses were asked how many clicks away from the college or university homepage their official card office page resides. Only 7 responding campuses are a single click away from their respective university homepage. The average number of clicks from a campus homepage to the card office page was 2.7. The mean and the mode of the collected data shows that the majority of respondents were 3 clicks from the campus homepage. While the survey doesn’t account for every university, the survey findings do paint an effective picture of the importance of card office accessibility. Moving forward, the Association highlights some initial efforts that campus card administrators can take to better position their card services websites. As a first step, card offices should work with the appropriate departments at their institution, and open talks about establishing a direct link to card services from the university homepage. It can’t hurt to have a dialogue. If being included in the top-level navigation isn’t possible, try to get a direct link on the card services larger, departmental web page. Other options could include a photo of the sample card or an image with the card branding that links back to the card services page. Every navigational click that a card office can eliminate will improve the probability that campus community members can easily find valuable card services information. Ultimately, the more visible the campus card is on the university website, the more awareness and importance will be built around card services.